Help celebrate Daddy’s first Father’s Day! This is the perfect Father's Day gift for the new Daddy!! 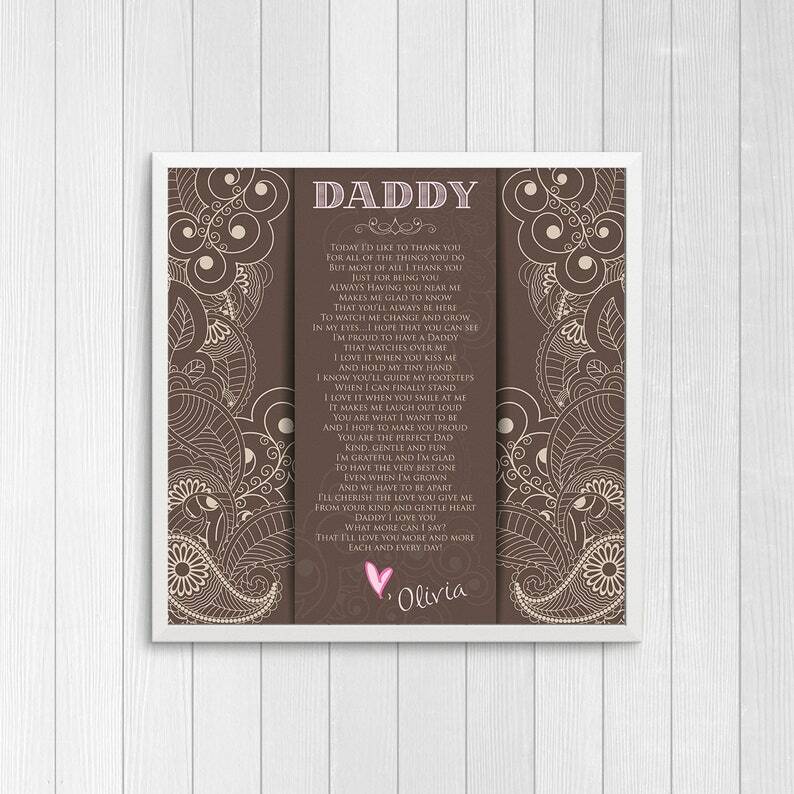 This personalized poetry print features your child's name and custom colors to match your decor. This print is designed to be a gift from new baby daughter to her special Father and sure to bring happy tears for years to come. * All prints are professionally printed on high quality archival photo paper and pigment inks which, when placed behind glass, will last for 100+ years! * All prints are carefully packaged so your print will arrive in perfect condition! * This print is the perfect gift for a new Daddy! 2. Email me the name (or desired text) to eoblanchard [at] gmail.com. 3. You will receive a proof via email within 1-3 business days. 4. Once you approve the proof, I will process and ship your order within 1-3 business days. If you would like this print on canvas, framed and/or matted, please convo me and I can set up a custom listing with applicable pricing. The colors you see on your monitor may vary slightly from the print that you receive due to differences in monitors. Man Cave Sign | Man Cave Decor | Gift for Him | Gift for Dad | Gift for Father | Gift for Grandpa | Father's Day Gift 12 x 12 in.